PROVEN, POWERFUL AND RELIABLE KUBOTA DIESEL ENGINES: The M5 Series tractors are powered by the very popular V3800 series Kubota Diesel engine, which is a 3.8 liter, turbocharged, Tier 4 final engine. Packed with up to 105.6 HP, the M5 Series of tractors is ready for a multitude of heavy duty tasks. GREAT MANEUVERABILITY: The M5 Series also has the time tested Kubota bevel gear front axle, which allows for low maintenance, exceptional turning radius and better ground clearance when compared to traditional u-joint front axles. The bevel-gear front axle provides the M5 Series with greater all-around maneuverability, whether you’re in the tight confines of a barnyard or straddling tall windrows in a hay field. The limited slip differential on the front and differential lock on the rear are standard features, offering increased stability and traction on the challenging ground conditions. 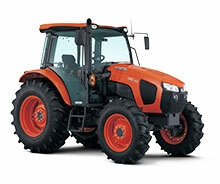 ULTRA GRAND CAB II: Kubota has raised the bar with regard to space and comfort on the M5 Series tractors. With a full flat floor, tilt steering and ergonomic controls, the M5 tractors make your hard day at work easy. The Ultra Grand Cab II has a built in sunroof with a retractable sun shade, giving you an excellent view of the loader when stacking bales. With the large degree of tilt steering adjustability and optional air ride seat, you’ll think your living room just got a new view.